In homage to the dudes at Mutant Frog – a post that combines Japan and robots! A Kyoto researcher has built an android which looks almost exactly like him, and has on occcasion sent it into his classes at Osaka University to deliver lectures for him. (Japan, robots and the Kansai region – score!) The print version of the story is especially hilarious, as it includes a small picture of the professor and his robot double. They’re eerily similar, but the robot has this cross-eyed scowl, like the puppet Kim Jong-Il in Team America: World Police. Still, the guy has form – he built the team that won the first robot world cup. Now I think about it, I wouldn’t mind having robots delivering lectures to me. And after the recent dispute over UK university workers’ pay, neither would those in charge of the universities. Until the army of robo-academics inevitably rises up to crush their human masters, of course. Then workplace relations in academia will be a very different place. What on earth will David Lodge write about then? Apparently the strategy started with a big Israeli blitz against Hamas’ money in the early ’90s, where a number of Hamas fundraisers were caught by Israel and sent to prison for supplying money to the charitable and ‘military’ sections. From then on, the decision was taken to separate the two, at least in public. JOHN WARE: I’m curious about that little sign up there. What exactly is it? HASHEM RJOUB, ORPHANAGE DIRECTOR: ‘Do not disappoint the orphan.’ This is a Koranic verse. The Koran encourages us to protect the orphan. JW: And that red colour coming down the arm and spilling over the world? What does that signify? HR: By God… It’s not clear whether it’s blood or not, but in truth it looks like it might be. JW: It conveys to me a picture of Islam dominating the world, and if necessary through bloodshed. HR: It’s true. This picture expresses the vision of the person who drew it. This doesn’t necessarily mean that these things exist. I want to stress that Islam has ruled most of the world without blood. There was no blood, it was through persuasion. The programme also includes an inteview with Yusuf al-Qaradawi, in which he talks about the role of Islamic charities, saying: “Don’t talk about donations. I think of it as jihad with money.” Usually these would be the ramblings of some extremist idiot, but according to the programme he is the director of an umbrella organisation of Islamic charities. Hamas has long used its charitable/social work arm to gain support in the deprived Palestinian territories, which probabaly led it to victory in January’s elections. This takes me back to something Jamie K wrote during the Israeli attacks on Gaza back in early July. To paraphrase: as a non-state organisation, Hamas was far more effective than it currently is as a quasi-state. This kind of charity-based largesse is easy to pull off, and easy to conflate with terrorist actions, when you don’t have any government budgets to balace, as well as government institutions that can be bombed to bits at a moment’s notice. The Charity Commission comes out very badly in the programme, though from talking with my dad that doesn’t seem so surprising. He has personal experience of dealing with them in the early ’90s, when they refused to take action against a “charity” run by one guy who had applied for funding so he could get a rent-free office to run his other businesses. The developments in charity organisations, where they would become tools for political groups or for chancers looking for free money, seemed to pass the Commission by. Well, that’s my inner Harry’s Placer all tired out. As for the general shitstorm in the Lebanon, I’m too sick of all the carnage to form an opinion, thought Shuggy’s masterful post is a good starter in itself. On the west side of the village Huangyangtan is what I take to be a military facility of some kind (judging by the masses of olive-colored trucks parked there). And right next to that is a scale-model of a landscape. I haven’t tried to identify which region it depicts, but it doesn’t seem to be a model of the region where this has been built. The model is mostly mountain ranges, complete with lakes and snow-capped peaks. It’s of territory occupied by China but claimed by India, north and south of the east end of the Karakoram range. It appears to be a 500:1 scale model of the Aksai Chin region, disputed territory occupied by China but claimed by India. A road built through this territory by China was apparently one of the flashpoints in the 1962 Sino-Indian War. The first thing this made me think of was one of my earlier posts, where I considered the possibility of India and Japan in a partnership of convenience against China. Then I started to think of what an amazing resource the internet is. That people from around the world can look into one of the most remote areas of a dictatorship which take its military secrets very seriously, then find out the source of the model, if not its purpose. To be honest, a huge military such as China’s is going to be full of projects that will never get off the ground, and probably weren’t intended to. Perhaps it’s just some generals inflating their budgets, and probably skimming a bit off the top while they’re at it. I got back from Barcelona yesterday, having some enjoyed some lovely food, wonderful scenery, and treatment from Ryanair that made me want to throw back my head and let out a full-throated, Jack Bauer-style “DAMMIT!”. Having left two of our suitcases behind in Stansted, and not getting them over to Spain until the last day we were there. We picked them up at the airport on our way out, only to be told our flight was cancelled. I pictured Michael O’Leary frolicking in a vault filled with Euros as we made our way to the Ryanair desk. There were two people there – very nice and as helpful as possible, but faced with two hundred-odd irate British tourists, many in full baseball cap and tracksuit regalia, they were all at sea. Disaster was averted as we phoned up Dad back home and got him to book us a flight out the next day. My trusty old Fuji Finepix F410, which I used to snap a near-obsessive amount of photos in Japan, stopped working the day I returned to the U.K. Sad as this was, it was the perfect excuse to get a new camera. So I picked up a Canon EOS 350D, with some money from my first paycheck. I’d seen it in Japan and liked the look of it, but over there it was called the Digital Kiss – a rather naff-sounding name for what is a fine bit of kit. Although I’m new to SLR photography, it’s been very cool playing with all the new features. And of course, Cambridge in the summer just begs to be photographed. 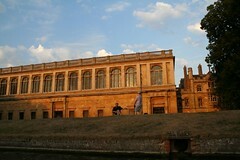 Taking pictures of the college buildings, from a punt, on a warm sunny evening, is one of life’s finer pleasures. I’m coming to the end of my final week at the language school. It feels like it’s gone really fast, and I’m torn between wishing I could stay on a little longer and just wanting to be shot of it. Similar emotions abound with regard to a few of the people I’ve met here, one in particular. The twin forces of attraction and repulsion are at work – she is very beautiful, which means I could look at her all day, but at the same time just being in her company reminds me of how little we have in common, and I want to avoid her. At some point I ought to wonder how many times I’ve been in this situation, and then reflect on what that says about me. But then, learning from my mistakes was never my strong point. What is your long term plans? Would they include returning to your homeland when civilised government is in place? How did you manage to leave a war torn country on the other side of Africa and get to the UK? Do you feel happy in a country when so many of the inhabitants dislike foreigners? China is on the other side of Africa? That’s an A* in Geography GCSE by today’s standards. “War-torn”, however? How do the Chinese use the concepts of Yin and Yang energy to bring much needed balance in todays busy and stressful lifestyle? What advice can Chinese people give to the materialistic people in the west, who no longer have any belieg system or spirituality, and lack direction in all their goals? Chinese society is traditionally very polite and modest. What then do your elders think of the current fashion in western countries where women are selling themselves as glamour models and exposing themselves in magazines? Do you find it degrading and insulting to women who are usually the respected head of a household in China? Would you like to see young Chinese girls acting and dressing like people here, ie models and people like Jordan, Jodie Marsh etc where they are practically naked? Traditionally, Chinese women were not the “head of a household”. They were viewed as a “curse” on the family for being unable to work like males, and were sold off as property in arranged marriages. The only time a woman’s life in traditional rural China got any better was when a young wife entered the household, who she would then treat like a slave. Top marks, though, for putting Jodie Marsh on the frontline of the East/West values conflict. I don’t think even Martin Jacques has done that yet. What do Chinese people think about Indian food?! Is it too hot and spicy for your taste? We use many of the same spices, eg ginger, garlic and chilli. Are Chinese people very conservative or adventurous in their tastes? Which type of food do you prefer, apart from your own?!!! Eat some Szechuan, that’ll answer your question. I can’t help thinking that these commenters are in need of a small “China explainer” like in the classic Tintin book The Blue Lotus, where a three-panel section dissolves centuries of prejudice by explaining that Chinese do not spend all their time eating bird’s nest soup and thinking up torture techniques. Although the portrayal of scheming, buck-toothed Japanese in the book might create more problems than it solves. Did you/ do you have problems understanding the irish accent? I’m English, and I still have trouble with it. Working with a couple of Northern Irish people has improved things though, so it has.